ELLE: So, Matt, you're a musical theater star who's been interviewed by The Advocate and much discussed on Manhunt.com, and you star in Glee, a program that's referred to as "the gayest show on TV." You must feel particularly proud being the first gay man to grace this page. 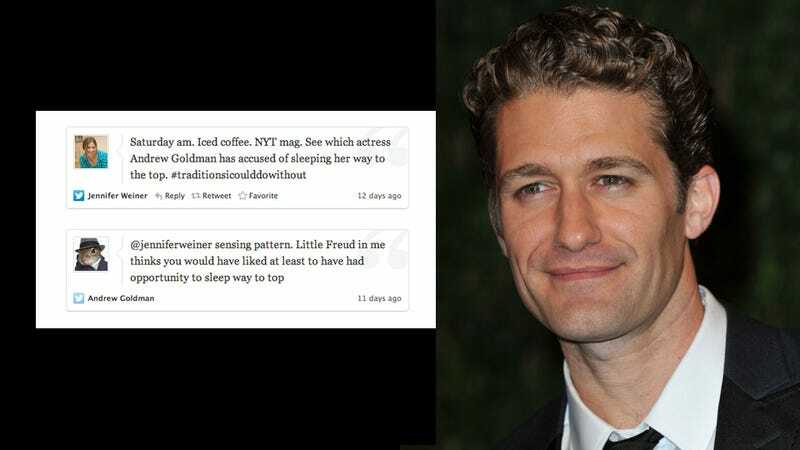 MATTHEW MORRISON: I'm not gay. ELLE: I had indeed read in various places that you're straight, but in light of the circumstantial evidence, I wasn't sure. MM: I grew up singing and dancing, so people have been calling me gay since fifth grade. I've heard everything you could possibly hear about it. But I do love gay people, so I'm not going to act like I was insulted or angry about it. ELLE: What was the first moment you realized you were a heterosexual being? MM: I was really sexual from an early age. My first kiss was actually with two girls at the same time. One girl would be behind the bush with me for a minute and the other girl would be timing us. Then they'd switch. ELLE: Dirty! Who was your first sexual obsession from popular culture? MM: Tiffani-Amber Thiessen from Saved by the Bell. I loved her. ELLE: How long before I pick up US Weekly and read about you two shacking up? MM: Oh, come on. She's married to a billionaire! And she just had a kid. ELLE: But her billionaire husband lives in Europe. Don't you need a man in every continent? MM: I don't need a man in every continent. The line of questioning continued, with Goldman asking, "Imagine you had the ability to see the number of a woman's sexual partners on her forehead. What's the highest number you could see and still take her seriously?" That was, like, the worst interview I've ever done, and it kind of turned me off from doing interviews completely, because that guy was such a d**k… It just turned into like a verbal sparring match and I was trying to be polite to him, but just right off the bat he came out with all these crazy accusations and stuff. So I was like, 'Ok, buddy... .' I was completely caught off-guard. There's no doubt that to be a good reporter, you have to ask challenging questions. Sometimes that means pushing buttons, making the subject uncomfortable. With celebrities, who have media training and canned responses, getting something new, different and exciting can mean going where other reporters haven't gone. But there is a line, somewhere. And everyone can tell when it's been crossed. And going after women and those you presume to be gay… not cool. Meanwhile, Jennifer Weiner, who was the recipient of Goldman's sexually charged tweets earlier this week, has accepted his apology and tells the Atlantic Wire: "Suspending Andrew Goldman wasn't anything I sought or asked for, but I believe it sends a message ... and it's a good starting place for addressing the overarching problem that allowed Andrew Goldman to tweet what he did in the first place." During the Weiner exchange, Goldman felt the need to tweet: "I feel like my record of asking direct questions to men is ignored in order to trump up misogyny charge." Noted!